Hmmm...I guess I like this wallie x3. But it seems...GREEEN x3. I was trying to show more of the color white then green but oh well x3...looks fine to me! x3...It features saber from Fate/Stay Night...and took me about um...like...five hours to make...I think I over used some brusehs x3...yeah x3...Enjoy! It's quite uncommon (to me) to see a winter wall in green tone color XD. 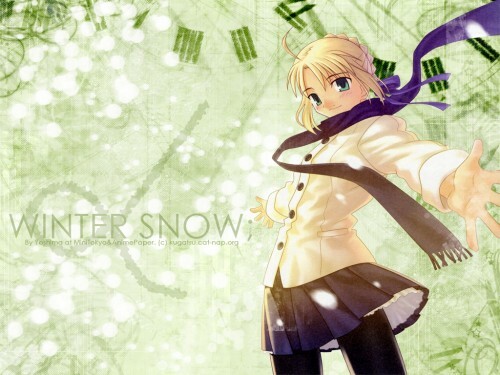 Really lovely, both the bg and Saber :D.
The background is fitting great to this scan. It's a very beautiful green and the clocks are fantastic.